We’ve taken the most popular space-saver shelf size and created complete units. Each unit includes tiered shelves with dividers, plus a top and base. 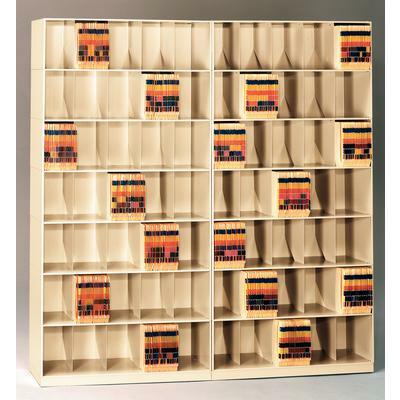 These stackable units are made of high-grade steel and have 4 permanently welded dividers that give structural support while keeping files upright. For extra strength, drive rivets and brackets are used to hold each unit together. Installation is extremely easy, requires only a hammer. Measuring your space is easy! Each unit is exactly 36" wide. When measuring, allow for floor moldings, wall trim or door clearance. When ordering, be sure to confirm UPS or freight shipment. Inside delivery also available, additional charges apply. All shipping and freight charges are paid by the customer and are not included in these prices. Orders cancelled after shipment are subject to round-trip freight, storage and a 25% restocking fee. 36" Straight Space-Saver Shelf Complete Unit, 6-Tier, 36" x 65-1/4" x 12-5/32"
36" Straight Space-Saver Shelf Complete Unit, 7-Tier, 36" x 75-5/8" x 12-5/32"
36" Straight Space-Saver Shelf Complete Unit, 8-Tier, 36" x 86" x 12-5/32"